I’m off to Japan tomorrow morning, to arrive on Friday morning local time. I think I’m ready, although packing for four weeks is quite a challenge. Whether, like me, you hate the crass spectacle that is the Olympics, or even if you don’t, you surely won’t like their link policy. 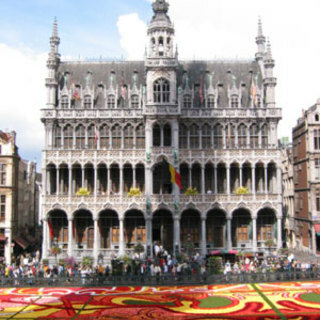 I went to see the Flower Carpet in the Grand’Place of Brussels yesterday. It’s very impressive: almost the whole of the square is covered by turf and flower petals, arranged in a Horta-inspired pattern. Taking the Eurostar? Read this.